Once in a rare while, Hollywood will take a chance on something that has never been done before. In 1985, Paramount Pictures tried this two-fold. They not only decided to make a film based on a board game but also decided to release the film theatrically with multiple endings. Based on the 1949 murder mystery game Clue (Cluedo in the UK) the film Clue carries the six main characters over from the game and turns it into a murder mystery comedy. 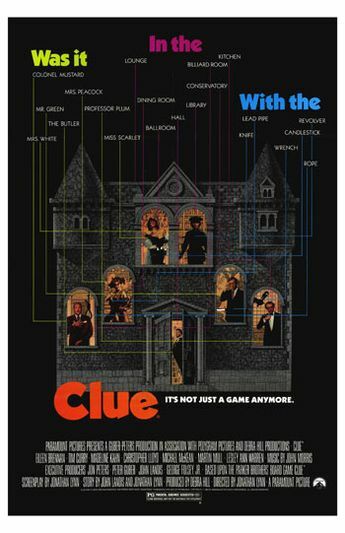 Clue theatrical poster (with all the requisite clues). With the majority of the film taking place in the confines of a sinister mansion, this is truly an ensemble film. All seven major characters (including the butler) and a few supporting actors give it their all to entertain. Whereas the game takes place after the murder has already happened, the film does a great job of setting up the motives for the suspects to be drawn together. 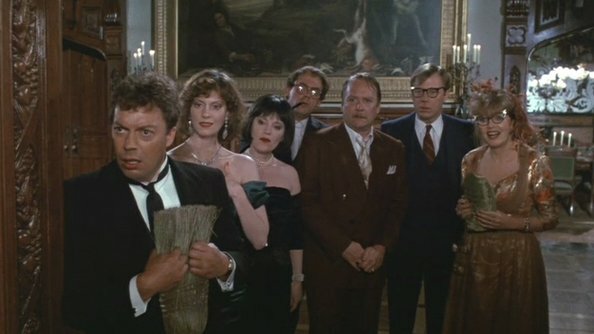 The Butler, Wadsworth (Tim Curry), arrives at the mansion and oversees the other two workers, the maid and the cook (Kellye Nakahara and Colleen Camp) as the guests start to arrive. With all the guests assigned pseudonyms, such as Professor Plum, Colonel Mustard, and Mrs. White, you see with suspicious eye contact and furtive glances who might know someone else. I’m tempted to just list the entire cast because they’re great. Okay fine, I’ll do it. Christopher Lloyd, Martin Mull, and Madeline Kahn get to interact with Michael McKean, Lesley Ann Warren, and Eileen Brennan. Throw in two musician cameos by the likes of Lee Ving (from the punk band Fear), and Jane Wiedlin (of the Go-Go’s) and you have a party. 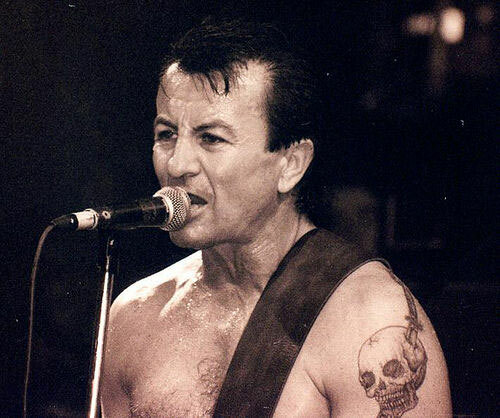 Mr. Boddy (Lee Ving) at his day job. I’ll admit, not all of the jokes work, but it’s such a joy to see these actors having a good time. They’re each given moments to shine, and the farce is all held together by Curry, who gets wilder and more unhinged as the film goes on. 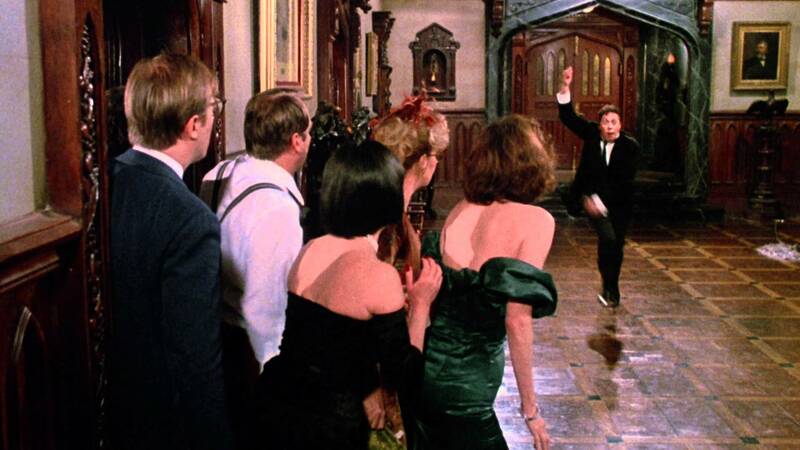 By the end of the film he has gone from straight laced butler to bouncing off the walls. When we get to his uncovering of the murderer it almost seems like he doesn’t take a breath. Which brings us to the second big risk Paramount took: they filmed multiple whodunit endings and released them separately in theaters. If you were lucky, you knew whether you were getting ending A, B, or C. If not, you might have a totally different experience than your friends in another town. Sure, some movies film multiple endings and when it hits wide release the filmmakers have chosen which ending works best for the film. But this is the first and only (as far as I’m aware) wide-distribution release to attempt this. Since 1985 no one has attempted this type of film release to appeal to the masses. The cast discovers a body. Of course at the time, it was a failed experiment. Whether it was the fact that it was based on a game, the reviews of the film itself, or dismal box office sales (it didn’t make back its budget), the major studios have shied away from this device. If used correctly, it could be a powerful tool, both in the film and in online commentary. In today’s online world where trailers are dissected to an unbelievable degree, imagine what would happen if a film tried this again and was able to maintain the secrecy until the release. The internet forums would explode; which might not be a bad thing. On to the real ending.